Long in development, Darren Aronofsky’s version of Noah, a biblical story that’s a staple of many religions, takes many liberties with its source material (angels are rock monsters dubbed The Watchers and God is referred to only as The Creator), yet delivers something that’s not only epic in scale, but powerful and valid too. Foretold that the world will soon be destroyed through dreams and visions, Noah (Russell Crowe) builds an ark to protect all that creeps, crawls and slithers, as well as his family – wife Naameh (Jennifer Connelly), their three sons Ham (Logan Lerman), Shem (Douglas Booth), Japheth (Leo McHugh Carroll), and Shem’s partner Ila (Emma Watson) – from The Creator’s desire to cleanse the world of all its evils, including ruthless Tubal-cain (Ray Winstone). If it’s the all singing, all dancing Sunday school version of Noah that you’re looking for, then this isn’t the film for you. 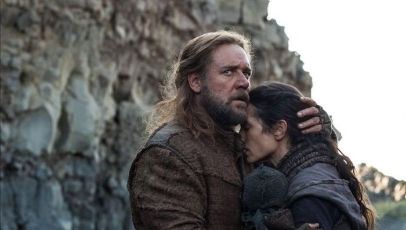 Aronofsky and co-writer Ari Handel have reworked the story to be dark and broody – one of tested morals and conflicted ideals as Noah’s effectively told to turn his back on mankind no matter what. The barren landscape, which is beautifully captured through Matthew Libatique’s textured cinematography, in which the film is set accentuates these feelings and creates an impression of how bleak and murky the world – and the people who inhabit it – has become. It’s a tough, gruelling watch, but one that resonates long after it finishes nonetheless. It also features some terrific performances, namely from Crowe and Watson, a haunting score from Cliff Mansell and a sequence detailing the Earth’s creation that’s utterly distinctive and inspired. Great review. I really liked the film and I agree that the cinematography was beautiful. A very odd movie!